Virginia played an instrumental role in winning American independence and determining the values and aspirations of the new nation. St. John’s Church in Richmond’s historic Church Hill neighborhood is a shrine to the foundations of our republic and the founding ideal of liberty. Built in 1741, St. John’s is the oldest church in the city and most famously was the site of founding father and statesman Patrick Henry’s fiery and impassioned “Give me liberty or give me death!” speech during the Second Virginia Convention in March 1775, paving the way for the American Revolution. 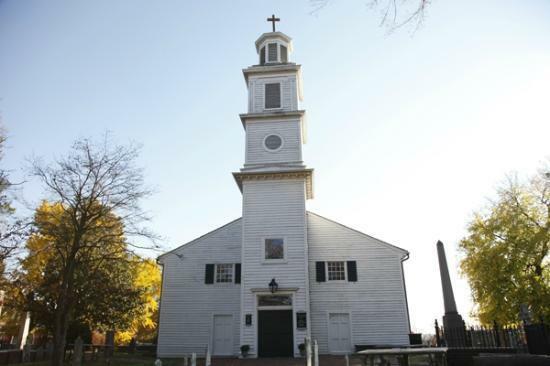 Visitors and tour groups have the opportunity to relive that historical moment by taking the 30-minute group tours or witnessing the riveting hour-long Liberty or Death reenactments put on by the St. John’s Church Foundation. Reservations can be arranged for your group by your NationsClassroom student travel consultant. For the group tours, costumed tour guides will have everyone sit on the original pews and describe the history of the church, the events in Virginia that led to the Revolution, and the intense debates of the Second Virginia Convention during which Patrick Henry delivered his immortalized phrase. Also, Patrick Henry’s storied life and political career will be covered. With the reenactment option, professional actors in 1770’s attire portray nine prominent Virginia delegates, including not only Patrick Henry, but also Thomas Jefferson and George Washington. Student groups will listen to them and engage in the debates of the convention, which then concludes with Henry’s speech. To be in same place as these gentlemen patriots and to learn how they fought for us to be a nation is truly inspiring. Please note that St. John’s is an active Episcopal church with an active congregation. There are times when a tour may not occur due to church services or other events. Let your students know that they are in a place of worship. It is appropriate to remove hats and caps upon entry and keep your feet off the kneelers. No food, drinks, gun, backpacks, or strollers are allowed inside. Cameras are allowed, but wait after the presentations to take pictures. The SCHOOL TRIP SPOTLIGHT is written by NationsClassroom's expert, licensed guides and features exciting attractions from the most popular student travel destinations on the historic East Coast. For more information, please Browse Our Tours or Request Information from our team of student travel consultants.